Celebz Gossips: Salma Hayek: Engaged and Pregnant! Double the good news for Salma Hayek: The actress is engaged to businessman boyfriend François-Henri Pinault – and she's pregnant. 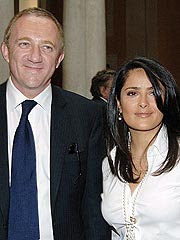 "Businessman, François-Henri Pinault, and his fiancée, Salma Hayek, are happy to announce they are expecting the arrival of their first child," Hayek's rep confirmed in a statement Friday. The news, first reported by New York Daily News columnist Ben Widdicombe (via gossip site Perez Hilton), comes just days after a photo of Hayek made the Web rounds prompting speculation that she was expecting. The pair have kept a relatively low profile since their relationship began – though Hayek, 40, has joined Pinault for occasional public events, including one in April at the festivities surrounding the inauguration of the Pinault Foundation's Modern Art collection in Venice's Gritti Palace. Pinault, 44, is the CEO of luxury goods firm PPR, which owns Gucci and Yves Saint Laurent, as well as a French department store and national music chain. His father, François, is an avid art collector owning more than 2,500 valuable pieces, including Picassos, Miros and work by contemporary artitsts including Damien Hirst. Familiar on both European and American fashion and art circuits, the family fortune is estimated in excess of $7 billion. Pinault, who was once linked to Nicole Kidman, was previously married and has two children. Hayek has most recently had her hands full on Ugly Betty, both as a guest star and as the executive producer of hit ABC show. Hayek previously dated actor Edward Norton for four years until 2003, before linking up with Josh Lucas, with whom she split in 2004.